I was amazed to discover that the four leading US carriers — AT&T, Sprint, T-Mobile and Verizon — generated more revenue last year than the 200 European operators combined. It's a remarkable statistic that illustrates the contrasting fortunes of operators on either side of the Atlantic. 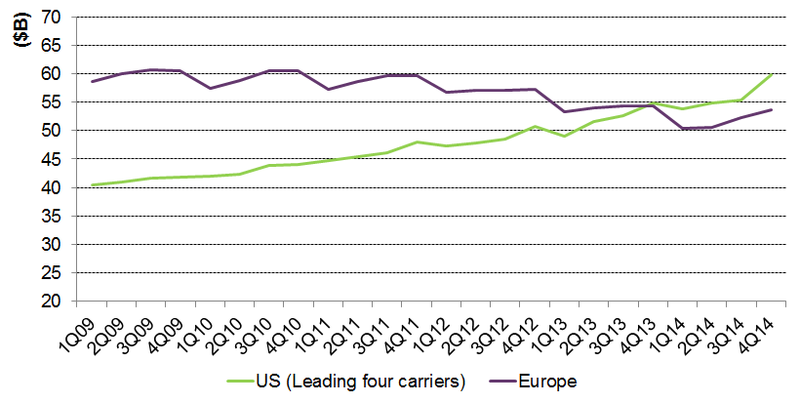 GSMA Intelligence states that mobile revenue in Europe was nearly 50 percent higher than in the US just five years ago. It's fallen by more than 10 percent since then — the result of tough EU legislation, the weak economy and rock-bottom tariffs. Southern Europe has been particularly affected, with revenue having plunged a staggering 40 percent in Spain and 31 percent in Italy over this period. However, US carriers have thrived, able to charge sky-high prices and quickly roll out 4G networks in a market of light-touch regulation and limited competition. In 2014, total mobile revenue was more than 35 percent higher than in 2009, eclipsing the whole of Europe for the first time despite a population less than half the size. Source: GSMA Intelligence, CCS Insight. Note: data for Europe for 4Q14 is estimated. Many markets in Europe are considerably less affluent than those the US, but I believe the trend still highlights the urgent need for more sympathetic regulation that offers more incentives for investment. Initial signs from the new regulatory regime in Brussels appear encouraging. I expect the stewardship of new commissioner Günther Oettinger to better unite the continent, and hope that this will be bolstered by a more coherent region-wide telecoms policy. Such moves will be crucial to Europe regaining status on the world stage after falling far behind leading Asian and North American markets in the deployment and uptake of 4G. The timing of the new administration coincides with a long-awaited easing of economic and competitive headwinds in the region, and I'm optimistic that the falling trend will shortly stabilise. Leading European operator CEOs provided a much more upbeat outlook during recent calls for analysts, and a number made positive revenue projections for the coming years. I expect to see further consolidation across the region as a part of regulatory changes. This would follow the approval of Telefonica's acquisition of E-Plus in Germany last year, and the recently agreed move for Hutchison to buy O2 in the UK. France and Italy could be the next markets ready to reduce from four mobile operators to three. I believe that Europe should consider a long-term strategy of consolidation to a much smaller number of leading operators that span the major countries in the region. I would caution against the assumption that the US will inevitably power ahead, despite having overtaken Europe. An escalating price war shows no sign of easing up, and the heightened competition led by Sprint and T-Mobile is starting to affect performance. AT&T saw average spending on mobile phones by contract customers fall by more than 10 percent in 4Q14, for example. This trend, combined with possible further disruption from Google's planned mobile service, makes it clear that the consistent growth rates of between 6 percent and 9 percent in recent years will no longer be sustainable. Regulation in the US may have been lenient, with average spending per customer remaining upwards of about $50 per month, but consumers have also benefitted from some of the world's most advanced 4G networks. The balance between encouraging investment and ensuring affordable pricing is a tough juggling act for regulators, and one that will determine the fortunes of operators on both sides of the Atlantic in the coming years.